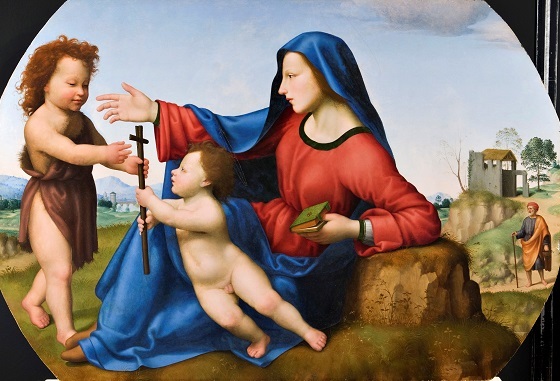 Madonna and Child with the Young St John the Baptist, n.d.
Oil on panel, 60 x 90 cm. The Virgin Mary sits humbly on the ground. With her cloak wrapped around her head and her hand reached out in a welcoming gesture, she is reminiscent of a fortune-teller predicting the children’s future sufferings. The expression of the young St John the Baptist is gentle and serious. He is dressed in a camel-skin tunic that references his life as a hermit in the desert. He reaches the cross out towards the Christ Child, who accepts it with an almost sorrowful expression. The small, pale body of Jesus contrasts with Maria’s ultramarine cloak and burgundy dress. Through this meeting, the mutual fate of the two children has begun. John the Baptist will come to lead the way for Jesus, and he is known as the Baptist because he later baptises Jesus in the Jordan River. Bugiardini is the only artist from the Florentine school represented at The Nivaagaard Collection. Following his apprenticeship with Ghirlandaio, Bugiardini opened his own workshop where he mainly produced small andachtsbilder and portraits. His work is clearly influenced by the great masters such as Michelangelo and Raphael, as well as by the more conservative painter Albertinelli, whom Bugiardini shared a workshop with for a while. The harmonic and monumental compositions with strong contours and almost plastic figuration, along with the clear and pure colours, all testify to the artist’s Florentine background.